A hard wearing, protective satin finish, based on polyurethane alkyd resins. Ideal for use on most concrete and wooden floors, such as garages, warehouses and workshops. Coverage approx 11m2 per litre. Use 12" solvent resistant roller sleeve 69803 . Hazard safety codes: R10, R66. 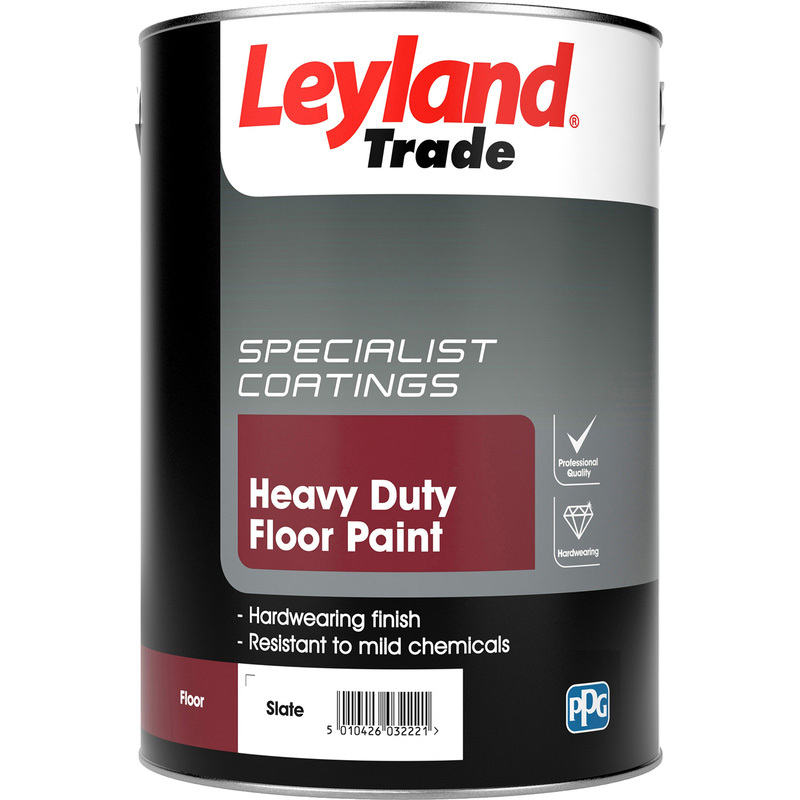 Leyland Trade Floor Paint 5L Slate 5L is rated 4.8 out of 5 by 13. Rated 5 out of 5 by Mervyn from Easy to apply. Very easy to apply and paint cures in about 48 hours to a very hard wearing surface. Very pleased with product. This is my third purchase in various colours. Rated 5 out of 5 by FBL2 from Good quality Purchased for the garage floor, good coverage, 2 coats given, 1/4 tin left, very pleased with product. Did seal the concrete before applying. Rated 5 out of 5 by on the move from a good product I power washed our old garage floor mixed some unibond pva with sand and cement to fill any holes in the floor , let set and then gave the floor 2 coats of floor paint the first used quite a lot of paint the second not so much. Looks good and bonded well best the floor has ever looked, I recommend this paint. Rated 5 out of 5 by MAJM from To good to walk on After painting the walls and ceiling white to increase the light in the garage the last thing to complete was the floor. Swept, vacuumed and sealed the brand new garage floor and when it was dry applied two coats of Leyland floor paint, wow what a difference, had 1 litre left over for touching up later. Rated 5 out of 5 by Robbie966 from Good product. Gave 20 foot by 12 foot garage base its first coat. Took the whole can to cover. Was a joy to work with and covered well. Will need another can for a second coat but very happy with it so far. Used along with the 12 inch roller and medium pile head also purchased from toolstation which worked great. Rated 5 out of 5 by Degs from Top quality This is top quality paint. I bought two tins to seal a workshop floor and it has sealed it well and so far is hard wearing with no lifting. Excellent fast service as well..